So it’s Christmas next week, which means, as per usual, not very much going on in terms of independent cinema in Toronto but shed loads of films shoved out in the multiplexes to get that much sought after cash of people who want to sit in a darkened room. 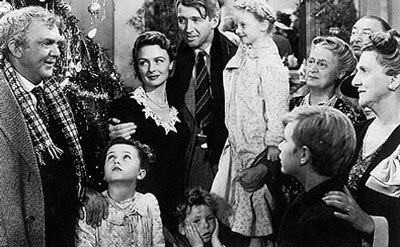 Ironically, of course, all of the festive films came out in about September so they could bleed as much cash out of them as possible, so there’s really very little Christmassy (or Chanukahey, or Kwanzaey) on, unless we count the Bloor showing It’s A Wonderful Life at 7 pm tonight (it’s a free screening for members, too). Perhaps you’d rather embark upon some high irony by going to see Children of Men on a day when many folks are celebrating someone who was, by definition, not a child of man (Santa is some kind of an alien, I think.) This tale of a dystopian future in which no one can have kids stars Clive Owen because he didn’t get to be James Bond. We’re well aware that referring to futures as dystopian is very cliché, but it turns out neither Eye’s Jason Anderson nor Now’s John Harkness avoid it, both slipping it in without thinking, probably. The question posed by their reviews: how depressed do you want to be? Very? Then check out Children of Men, then. Of course, you could go for the other offering from a Spanish director this week, Guillermo Del Toro’s Pan’s Labyrinth. Given rave reviews by basically everyone since it was seen at TIFF2006 (where we were gutted to miss it.) “It is masterful, heartbreaking and his finest work to date,” says Todd Brown of Twitch Film. What else it out this week? Let’s see. We’ve got The Painted Veil, Notes on a Scandal, Dreamgirls (see David Topping’s take here), The Good Shepherd, Fur: An Imaginary Portrait of Diane Arbus, Curse of the Golden Flower and We Are Marshall. We think that’s them all. Happy Holidays, everyone!